April 7, 2011, Auburn Hills, Mich. - Each year, thousands of diehard off-road enthusiasts descend upon Moab, Utah, for the Easter Jeep Safari and a week of fun on some of the country's best and most rugged trails. Jeep and Mopar are marking the occasion by returning to the annual event -- which takes place April 16-24 -- with six new customized vehicles. "The annual Moab Easter Jeep Safari provides us a perfect opportunity to interact with our most loyal fans in a true Jeep setting," said Mike Manley, President and CEO -- Jeep Brand, Chrysler Group LLC. "We are able to demonstrate and test new potential Jeep production and customization ideas at our away-from-home proving ground, while getting instant feedback from our customers." More than 30 percent of the people who are in the market for a new vehicle are influenced by the breadth and availability of aftermarket accessories and Mopar comes to the party with a vast selection of accessories that will fit a variety of lifestyles. "From full engine packages to slush mats, Mopar has everything for the avid off-roader," said Pietro Gorlier, President and Chief Executive Officer -- Mopar, Chrysler Group's service, parts and customer-care brand. "In fact, Mopar covers the spectrum with more than 280,000 proven quality-tested parts and accessories that allow customers to personalize their Chrysler, Jeep, Dodge, Ram and Fiat vehicles." Over the past decade, a dedicated group of engineers, designers and fabricators from Mopar and Jeep have customized more than two dozen vehicles and a host of off-road parts and accessories, and showcased them to the enthusiast crowds in Moab. The primary focus in the development of "Pork Chop" was to increase Jeep Wrangler's off-road fun and performance even more through extensive weight savings. The project started with a new 2011 Jeep Wrangler Sport. Weight savings began with removal of a long list of items, including: doors, top, tailgate, bumpers, carpet and sway bars. Body modifications began with removing the rear tailgate hinges and latches and creating a custom surround. The inner fender panels were reshaped and the taillamps relocated closer together. A custom roll cage was crafted and the windshield height was reduced two inches. Hanson Bumpers provided a set of unique aluminum bumpers and QMC contributed their prototype aluminum/carbon fiber hood, held in place with Drake aluminum hood latches. Mopar added an aluminum cold-air intake kit, lightweight fender-flares, slush mats and mirror re-location brackets. The interior was updated with bright red lightweight Sparco "Chrono Road" reclining bucket seats. Gale Banks added a unique set of long tube headers and dual-exhaust with an integrated H-pipe to replace the stock system. Further weight savings was recognized courtesy of a Gen-Right-fabricated, prototype rear-mounted 20-gallon fuel tank and aluminum skid plate. A smaller evaporation canister for the emissions system was borrowed from a 2012 Fiat 500. The massive weight savings actually lifted the suspension, which was combined with a moderate Mopar lift to clear Mickey Thompson 35-inch Baja Claw radials mounted on lightweight 17x8 E-T Vintage V wheels. The suspension includes Bilstein 2-inch shocks with reservoirs and TeraFlex air bumps at all four corners. Dynatrac Axles designed lightweight ProRock 44 front & rear axles fitted with 4.88 gears, ARB air lockers and prototype aluminum differential covers. The axles are located with unique aluminum control arms provided by Full Traction. The result is a weight savings of more than 850 lbs., and even more open-air Jeep Wrangler fun. For 2011, the team has built up its first Jeep Compass. The project began with a new 2011 model equipped with Freedom Drive II drivetrain. The Compass Canyon features a 2-1/8-inch lift kit provided by Rocky Road Suspension, making room for Mickey Thompson Baja ATZ 225/75-R16 tires with 16-inch alloy wheels from a Jeep Liberty. To gain additional wheel articulation, front and rear sway bars were removed. Select items from the Mopar catalog include a cold-air induction kit, cat-back exhaust system, slush mats and a sport pedal trim kit. To protect the underbody, the team installed an extensive set of front and rear skid bars, sill guards and longitudinal skid plates to fend off the harsh rocks on the trails of Moab. The mission for the Jeep Cherokee Overland was to create a small, light adventure platform alternative. The template is a built-for-export 2011 Jeep Cherokee (Jeep Liberty in the U.S.) equipped with a 2.8-liter CRD 4-cylinder turbo diesel and Selec-Trac II 4x4 system. ARB offered their steel roof rack, awning, compact refrigerator and prototype rock rails to set the Overland's mood. To increase off-road capability, an ARB 3-inch suspension lift and Old Man Emu shocks clear the way for Mickey Thompson 265/75-R16 MTZ tires mounted on steel wheels. Traction is increased with the addition of an ARB air locker in the rear differential and on-board air compressor. To blend in with the wildlife, an update of the classic zebra safari pattern paint scheme is added to the exterior. At the heart of the Jeep Wrangler Renegade is the all-new 475 horsepower, 6.4-liter HEMI V-8 from Chrysler Group LLC's Street and Racing Technology (SRT) engineering team. Harkening back to the 1972 Jeep Renegade, which was offered with a V-8, Jeep and Mopar mated the HEMI to a 6-speed manual transmission feeding a Dynatrac prepped ProRock 44 front axle and ProRock 60 rear axle, both equipped with ARB air lockers and 4.10 gears. To clear the 35-inch Mickey Thompson Baja Claw radials mounted on AEV Pintler wheels, an AEV/Nth Degree 4-inch suspension lift was installed. Mopar added a heat dissipating hood and a new winch-mount front bumper. Other Mopar accessories include: fuel door, sill guards, bikini top, rock rails, slush mats and a half-door kit. Warn provided their all-new 9.5 CTi series winch and AEV finished off the Renegade with their rear bumper/spare tire carrier combo. The interior was treated to a Katzkin seat trim kit sourced from the Mopar catalog and the exterior was finished in a black and gold paint scheme that recalls the early 1970.s CJ5 Renegade model. Taking cues from the popular Jeep Scrambler CJ-8 from the 1980's, Mopar has designed a kit for do-it-yourselfers that converts a Jeep Wrangler Unlimited into a pickup truck. The bed length is 50 inches and the width between wheel wells is 44 inches. The team created body panels to cover the second-row entrance and removed all of the interior parts behind the front seats.transforming the vehicle into a two-seater with just enough room for gear inside, and a pickup style bed to be used for outside cargo. The JK-8 drivetrain is fitted with a Mopar/Dynatrac ProRock 44 front axle and stock Dana 44 rear axle, both spun with 4.88 gears. Linking the axles to the frame is a 4.5-inch long-arm suspension kit and 37-inch BF Goodrich Mud Terrain KM2 tires make the connection to the ground. A fresh coat of yellow paint and Mopar's off-road bumpers for the front and rear were utilized along with a new fuel door and slush mats. The JK-8 kit includes bed floor, inner/outer body panels, half hard top (works with Freedom Top panels), and a new bulkhead. Inspired by the King of the Hammers race in the deserts of California, the Jeep Wrangler Blue Crush combines high-speed off-road racing and rock-crawling capability. At the core is a Mopar 426 cubic-inch HEMI with 540 horsepower. The all-aluminum V-8 is paired with a 545RFE performance transmission and a gear-drive transfercase. To help the suspension keep up with the engine, Mopar added a high-speed, performance off-road suspension system with internal bypass shocks, front stabilizer bar and full hydro-steering. Gigantic 39-inch tires are turned with the help of custom driveshafts. The Wrangler Blue Crush also features a baja-style full cage, race seats, fuel cell and short aluminum bumpers. 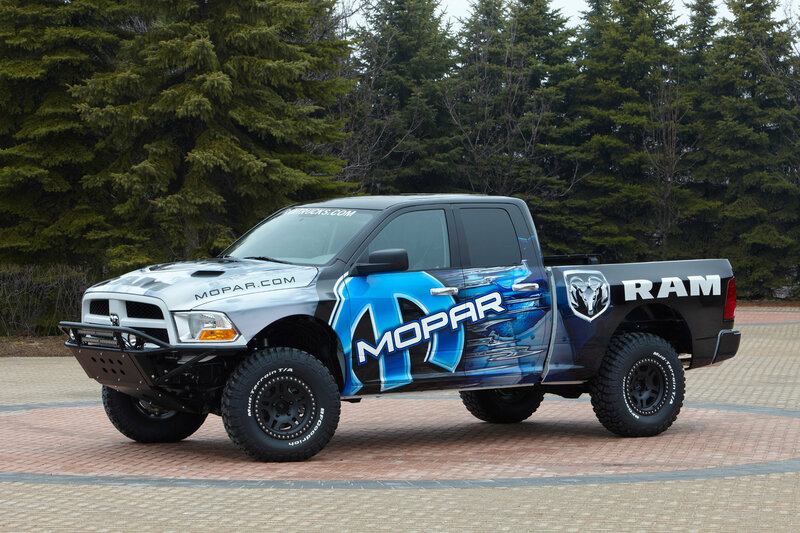 The available Mopar Ram Runner kit was inspired by high-speed desert off-road racing. The rigors of off-road racing require large tires, additional ground clearance and a sophisticated suspension system capable of withstanding tremendous impact. These features are combined with the proven HEMI 5.7-liter V-8 into a package that is stable at speed and rock-solid in the corners. Inspired by trophy trucks, steel front fenders and rear bed-sides are replaced with fiberglass layered in the Liquid Metal Mopar racing scheme. The high-clearance wheel wells allow tremendous suspension articulation with zero tire-to-body interference. Ram and Mopar will sponsor the 2011 TORC short-course off-road racing series and bring a significant on- and off-track presence to each round of the championship. Ram will become the official vehicle of TORC with the Mopar Ram Runner pacing all of the series' events. Jeep and Mopar will have a large display in the center of downtown Moab during the Easter Jeep Safari with these and a number of other customized vehicles on exhibition, including the previously introduced Jeep Grand Cherokee Off-road Edition, Jeep Wrangler Mayhem, Jeep Wrangler Immortal, Mopar Camper Trailer, Jeep Wrangler Tan Man, Jeep Wrangler "The General" and a fully dressed military version of the Jeep Wrangler J-8 with turret and passenger mounted-machine guns.